I guess most of us wouldn’t relate Winter with being thirsty. I am sure when most think of a place with very little water our minds would drift to a very hot arid environment, covered mostly in sand, and a blazing Sun. But Winter can lock the water tight in it’s most solid form. There is water everywhere in these pics, but it takes heat to unlock it to it’s drinkable form. The first two pics as well as the third one are taken of the exact same spot in Beaver Creek. What made the difference beyond being photographed about twenty days apart is that Winter has cast her magical spell of cold temps and moving wind to create her barrier over the moving creek. Frank and I have opened the holes in the first two pics to allow access to the water. 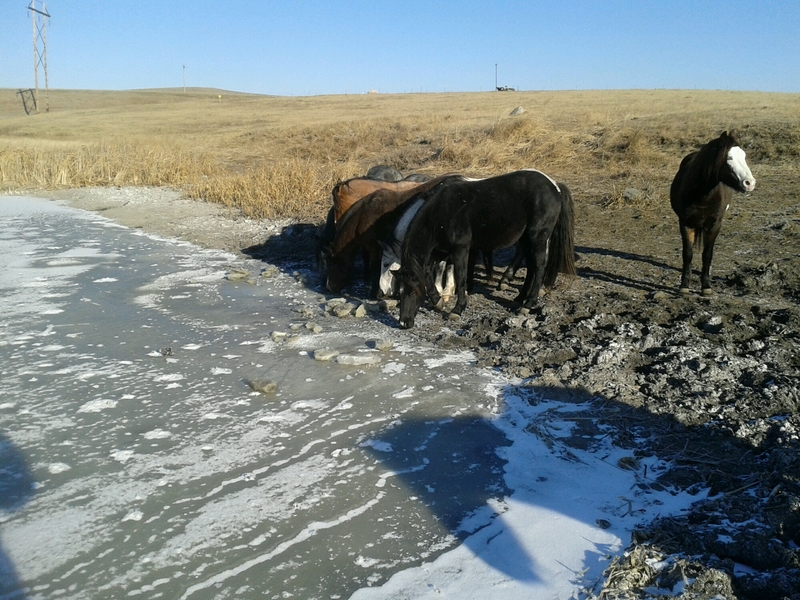 The horses are standing on the frozen creek. 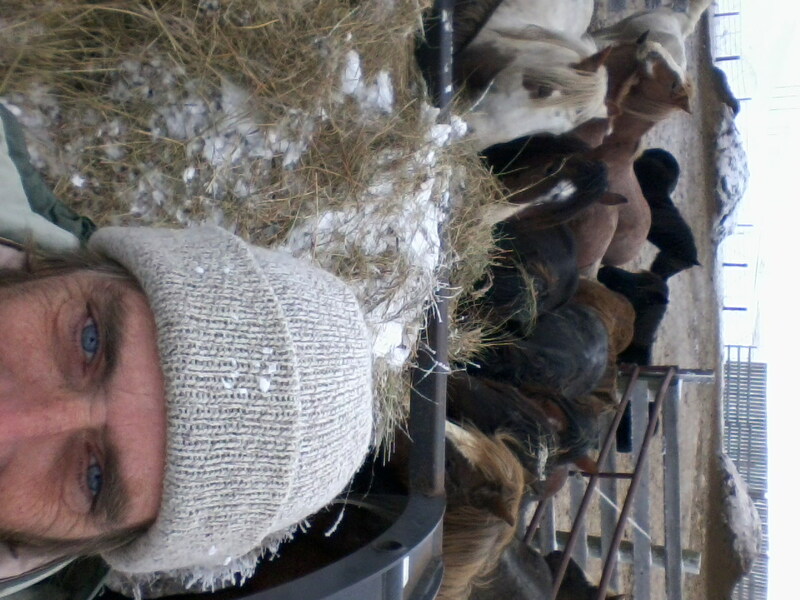 Last week it we had it open to the size of a large water trough but below zero temps and a good stiff wind sealed it up. 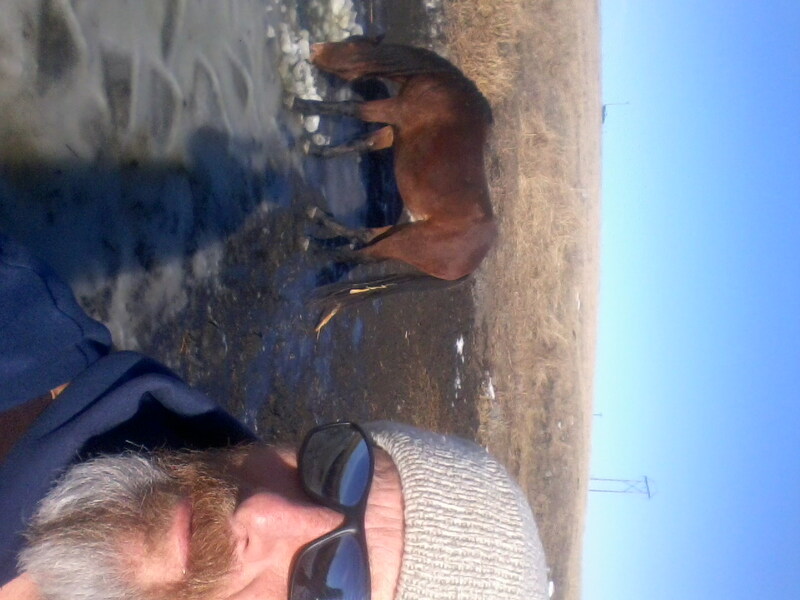 The even more interesting part is that Frank and I look for more than horse tracks leading to the opened water. 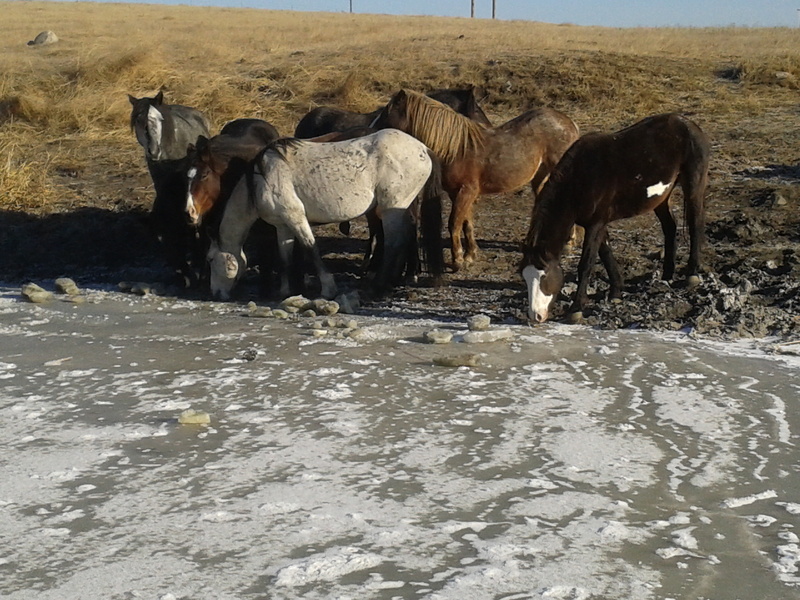 Deer, coyotes and others use the opened water to quench their thirst. That makes me happy ! I added the last pic to show you what I look like while I am out and about. Taken the same day as the first two. Yep, that is the moisture from my breath starting to freeze on my scarf. It was about -6 F when I took the recent pics with a windchill way down in the -20s range. Didn’t take long for me to stick my phone back in my pocket because my finger tips started to hurt. Brrrrr for sure. So next time you think of the searing Sun over a parched desert when you are thirsty this Winter. Take a drink and be happy where you get your water. Then wiggle your toes in your fuzzy slippers and smile at how warm they are. And oh yea ! Aren’t the ladies in the pics just beautiful !!! Promised myself years ago I would be someplace cool doing something that stirs emotion on my birthday. I have woke to a sunrise in the desert of Death Valley, watched a Bald Eagle teach her offspring how it is to be an incredible raptor on the Mississippi river. Just a few of many. And today ? -5 degrees F. Linton, North Dakota. -20 F tonight. Staying in and dinner and movie with my favorite dog. Happy Birthday to me ! Snow has come to Linton, North Dakota ! You start by dressing for the occasion after all it is North Dakota. Then you drive to the pasture, park, and grab a pick-axe. Take the pick-axe lay the head of it on the top wire of the three strand barbed wire fence so that it will partially pull the wire down. Then use the top of the pick-axe as a stable cane and step over the wire. Carefully. Then start hiking. Use the horse trails. The trails made by horses that is. Observe the beauty and remind yourself how lucky you are. Don’t leave the pick-axe, you are going to need it. The whole time the majority of your customers have their heads up watching what you are going to do. Get to the water that is now sheathed in Winter’s grip. In no time you should get a decent enough hole open. If you are lucky one or more customer will come partake in the product you are trying to give them access to. Take a selfie. Get more than you and the horses rear in the pic. Your friends would have a field day. Walk back using the horse trails. Similiar to game trails but way bigger! Observe the beauty, and feel the indescribable feeling of joy of being there in that moment. Look for wild animal tracks. Cross the barbed wire again. Sit in the truck and observe all around you. Tell yourself how lucky you are. Over and Over!